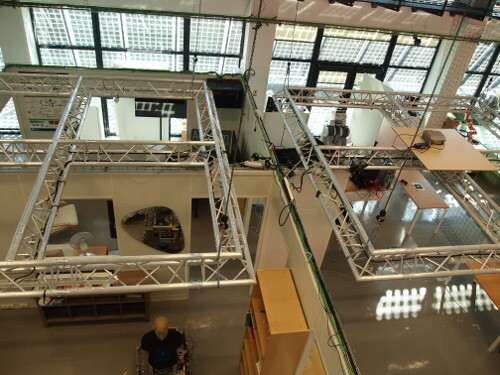 The Adream-building at the University Toulouse is a robot-lab space consisting of a large hall that contains four small rooms without concrete windows, doors, and ceilings. Fig. 60 provides a look from above on the part where the measurements took place. Fig. 60 Lab space in the Adream building, look from above. The measurement consists of two parts. The first part contains BRIRs with head rotations from -78° to 78° in 2° steps, as from the listeners perspective. Those measurements were done at four different listener positions and consisted each time of four different loudspeakers. Fig. 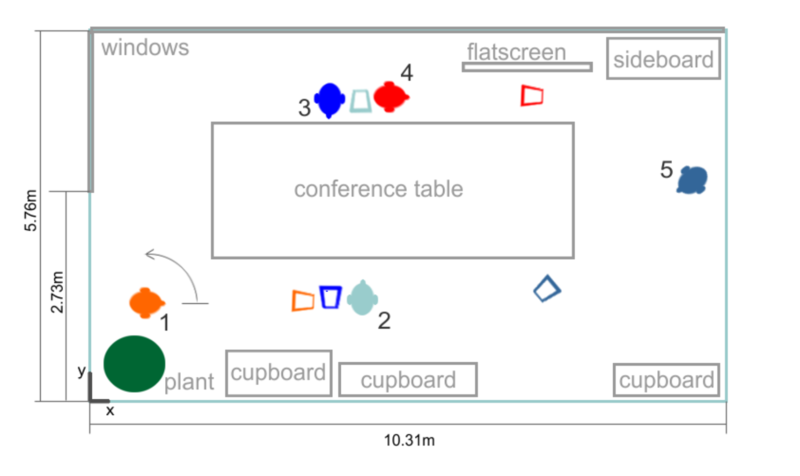 61 summarizes the setup with the actual loudspeaker and dummy head positions and orientations. Fig. 61 Setup of the measurements. For details see the PDF version of this figure. 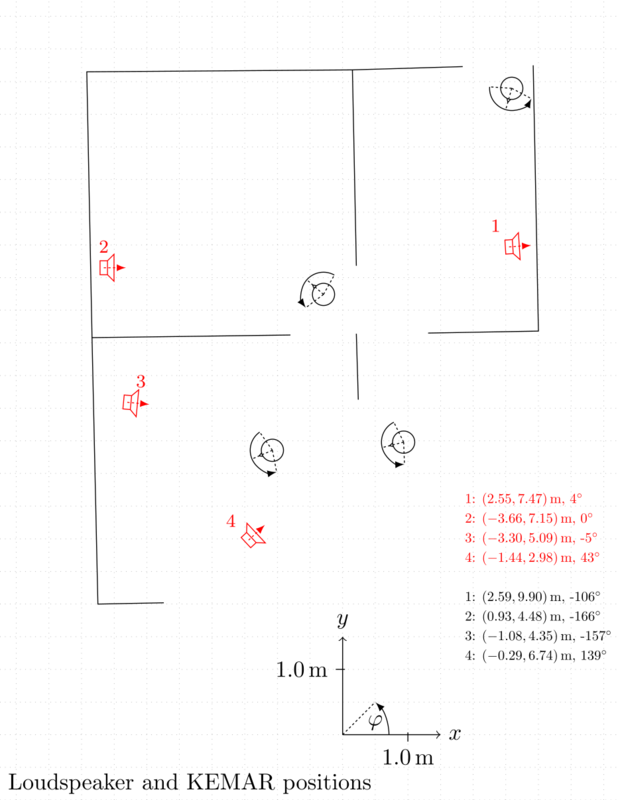 The second part of the measurement consists of a trajectory of 20 listener positions at which BRIRs were measured. 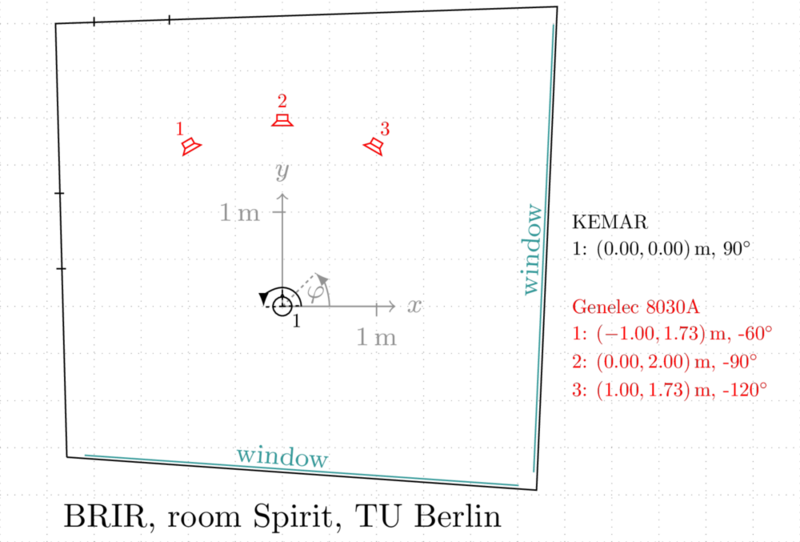 This measurement includes only a fixed head orientation of 0°, but the same 4 loudspeaker positions as the first one. Fig. 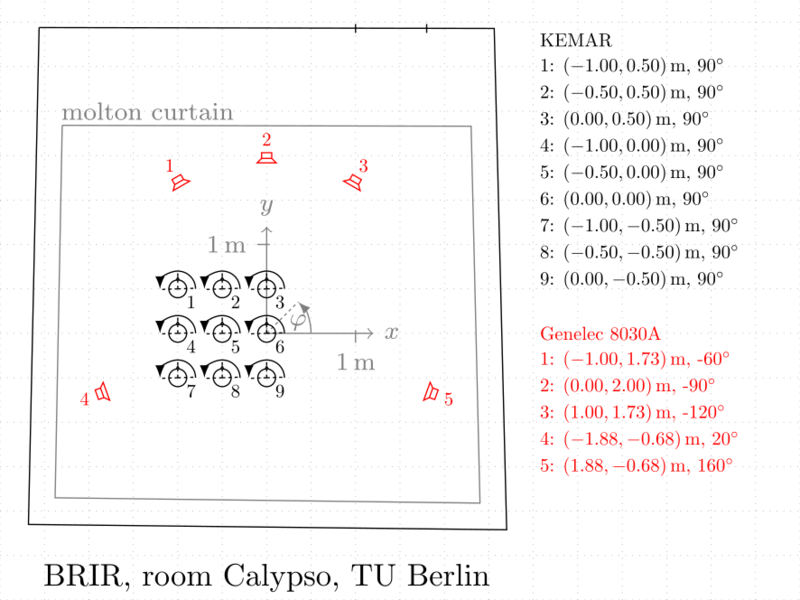 62 summarizes the setup with the actual loudspeaker and dummy head positions and orientations. Fig. 62 Setup of the measurements. For details see the PDF version of this figure. 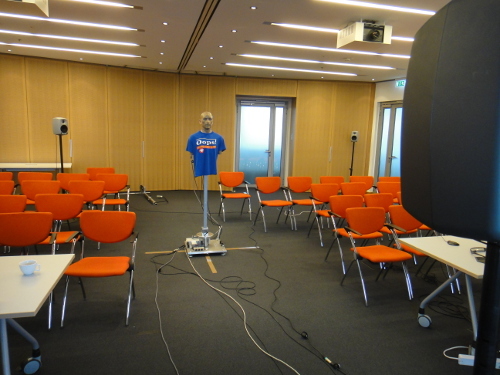 The BRIRs were measured at the mid-size lecture room Auditorium 3 at the Telefunken-building of TU Berlin. They were measured for six different loudspeaker positions. The head of the dummy head was rotated with a resolution of 1° ranging from -90° to 90°. The measurement equipment was the same as described in [Wierstorf2011]. The BRIRs were measured in the meeting room Spirit at the Telefunken-building of TU Berlin. They were measured for three different sources and with a resolution of 1° and head movement from -90° to 90°. 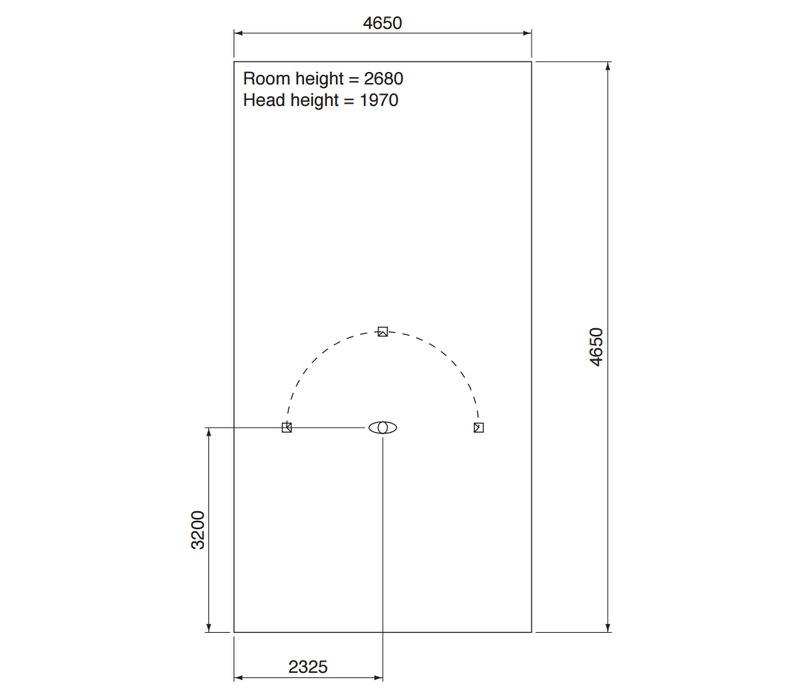 Note, that the photo of the room was not taken for the actual measurement setup. The measurement equipment was the same as described in [Wierstorf2011]. The BRIRs were measured using a KEMAR (type 45BA) with the corresponding large ears (type KB0065 and KB0066) in the studio room Calypso at the Telefunken-building of TU Berlin. 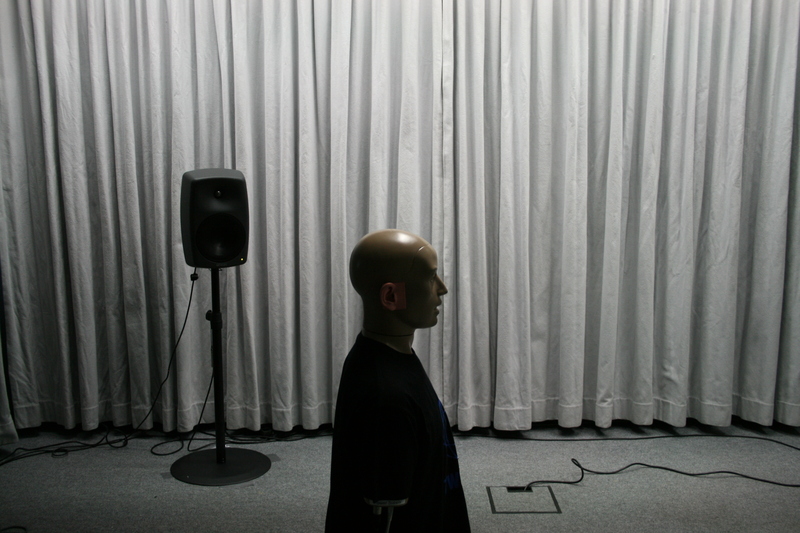 5 Loudspeakers were placed around the manikin to establish a 5.0 surround setup. 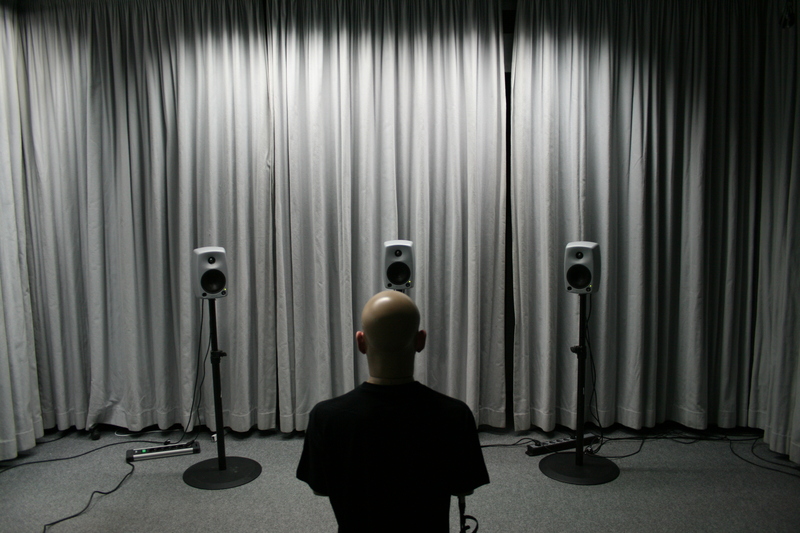 The measurements were done with two different two-way loudspeaker fabricates, namely Genelec 8030A (left figures) and Genelec 8250A (right). For the former, the measurements were repeated at 9 different listening positions (bottom left). 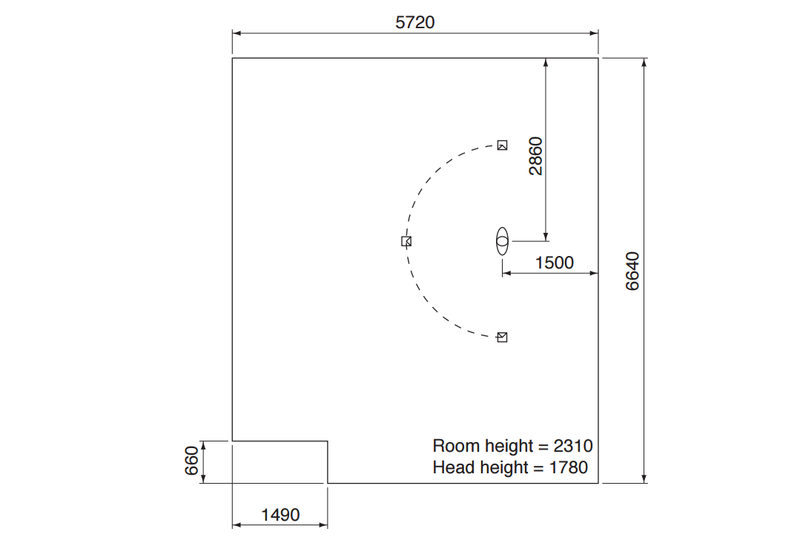 For each position of the manikin, its head was rotated horizontally from -90° to 90° with a resolution of 1°. 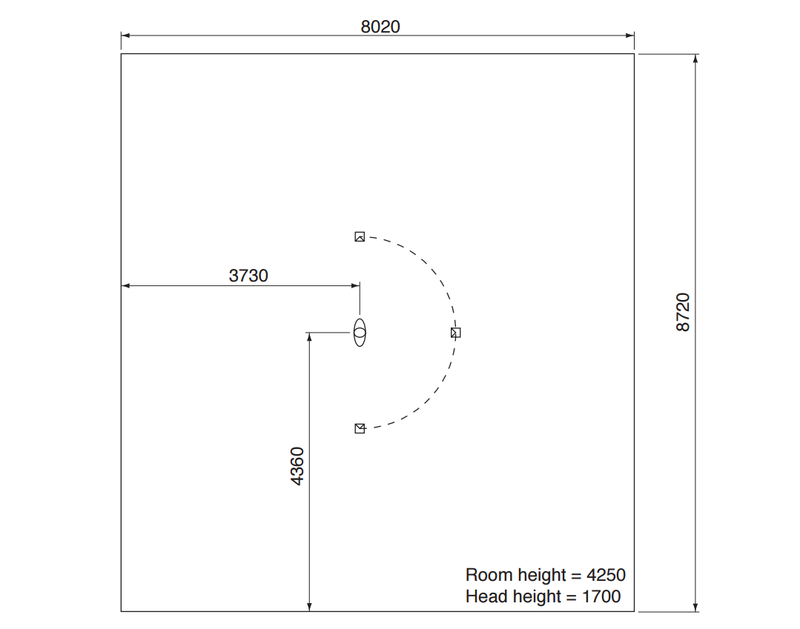 The room has a volume of 83 m³ and a reverberation time RT60 of 0.17 s at a frequency of 1 kHz. BRIRs for 19 different loudspeakers placed in room Calypso at the Telefunken-building of TU Berlin were measured. The room is a studio listening room. 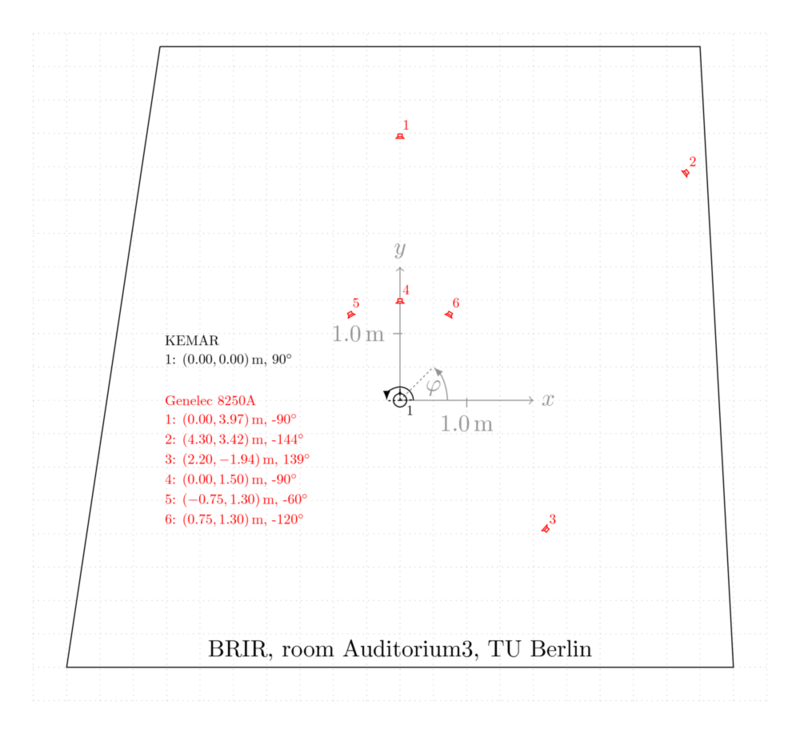 The 19 loudspeakers constituted a linear loudspeaker array with a inter-loudspeaker distance of roughly 15cm. The measurement was done with the KEMAR (type 45BA) with the corresponding large ears (type KB0065 and KB0066) and Fostex PM0.4 loudspeakers. The dummy head was rotated from -90° to 90° in 1° steps. The measurement was repeated with the head wearing AKG K601 open headphones. Fig. 63 KEMAR wearing AKG K601 headphones in front of the loudspeaker array hidden by a acoustically transparent curtain. Fig. 64 Setup of the measurements. For details see the PDF version of this figure. 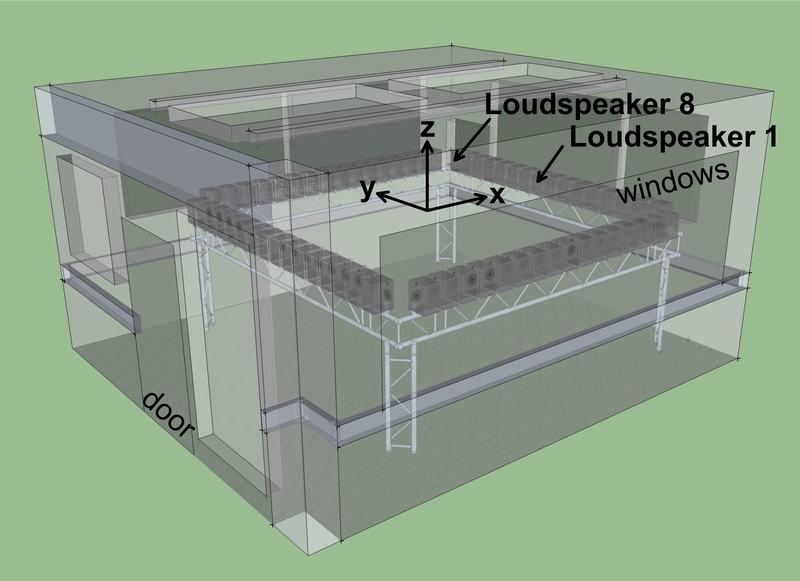 The database contains measured single-channel and binaural room impulse responses (RIRs and BRIRs) of a 64-channel loudspeaker array of square shape under varying room acoustical conditions. 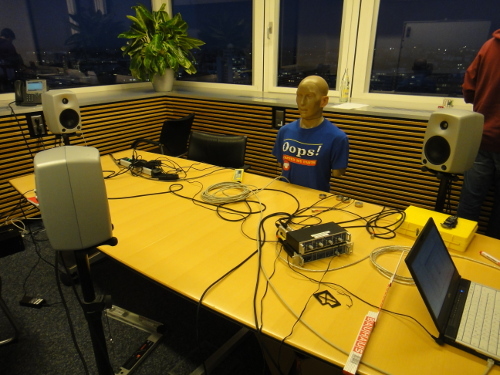 The measurements have been performed at the Audio Lab of the Institute of Communications Engineering, University of Rostock. The RIRs have been measured at three receiver positions for four different absorber configurations. Corresponding BRIRs for head-orientations in the range of ±80° in 2° steps with a KEMAR manikin have been captured for a subset of seven combinations of position and absorber configurations. Fig. 65 KEMAR Manikin in Audio Laboratory. Fig. 66 Sketch of Audio Laboratory. 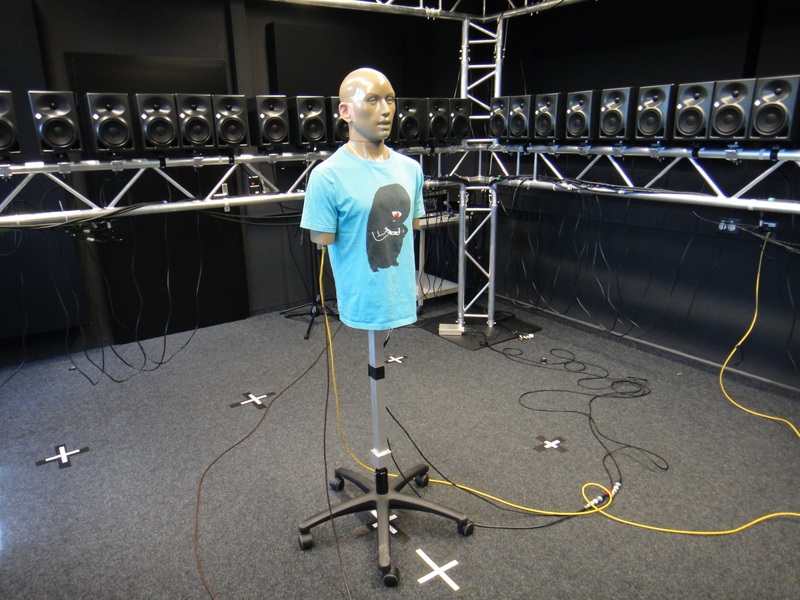 The BRIRs were measured for a 12-channel Genelec 8030A loudspeaker setup inside the University of Salford’s ITU-R BS.1116-compliant listening room. The B&K Type 4100 head-and-torso-simulator (HATS) was positioned at 15 different positions. The torso of the HATS was rotated horizontally in the range of ±180° in 2° steps at each position. Additional information can be found at the authors’ website. The BRIRs are measured with the Cortex Instruments Mk.2 HATS in four different rooms. A Genelec 8020A active loudspeaker has been used as the sound source. 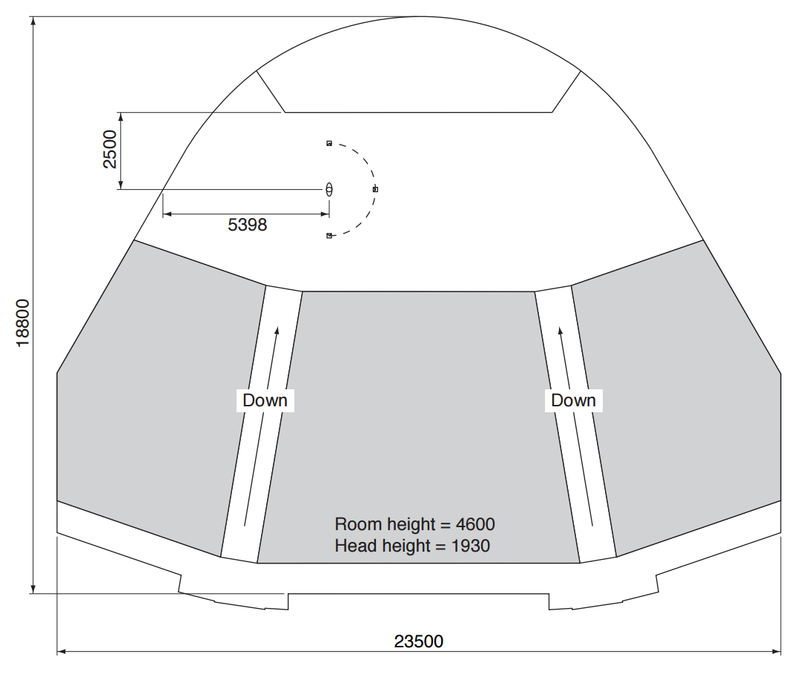 While position and orientation of the HATS is kept constant for one room, the sound source was placed in the horizontal plane at 1.5m distance with an azimuth between ±90° with an increment of 5°. Additional information can be found at the author’s website, on the github page and in [Hummersone2011]. 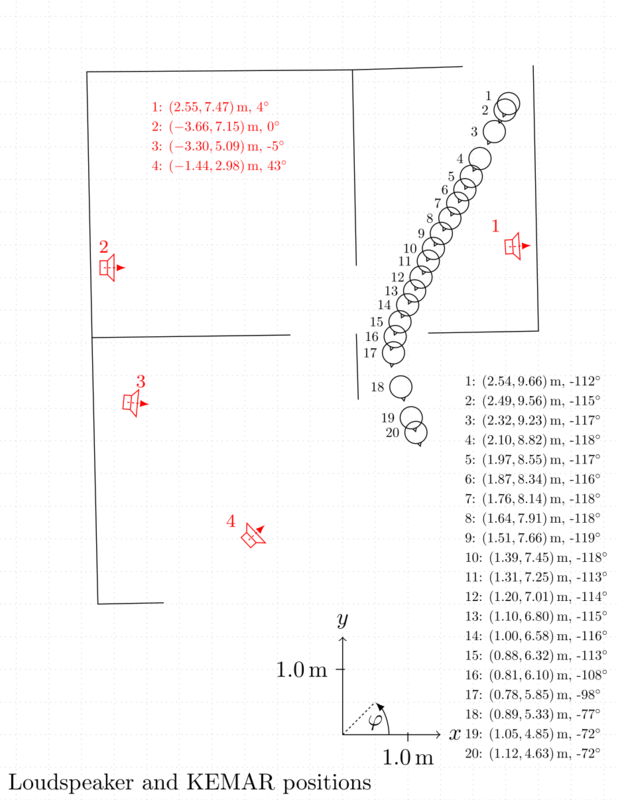 The Data has been converted from the original SimpleFreeFieldHRIR convention to the SingleRoomDRIR convention (see also here). Furthermore the azimuth angle convention was been changed from clockwise counting to counter-clockwise counting. 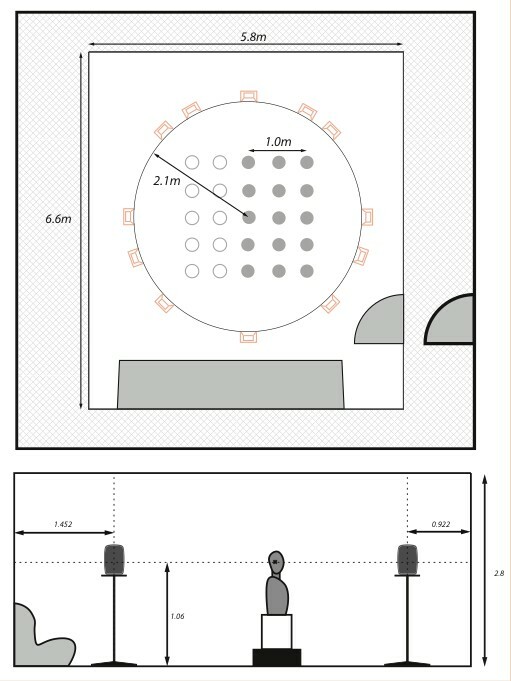 [Hummersone2011] (1, 2) Hummersone, C. (2011), “Binaural Room Impulse Response Measurements,” pdf. 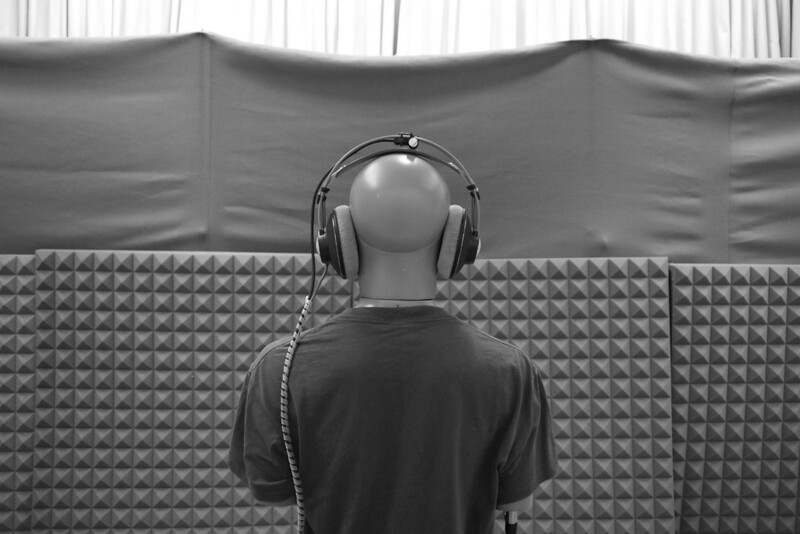 The BRIRs were measured with a KEMAR 45BA head-and-torso-simulator (HATS) with large ears using an active 2-way loudspeaker Genelec 1030A as the sound source. The HATS was positioned at five different locations, while the sound source has always been 2.5 meter in front of the HATS. The head of the HATS was rotated horizontally in the range of ±180° in 5° steps at each position. Additional information can be found in the corresponding paper [Neidhardt2016]. Fig. 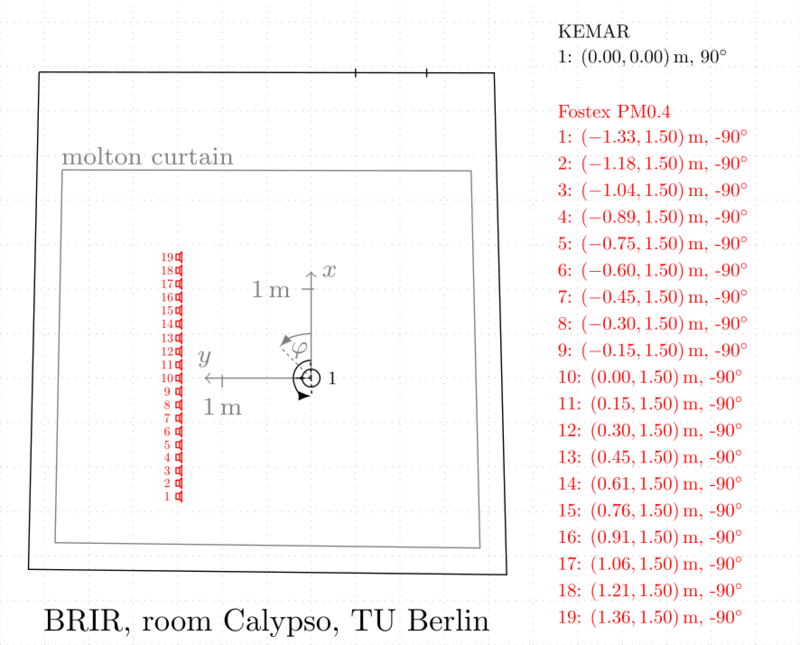 68 Measurement layout. For details see the PDF version of this figure.